A slightly perverted Hero that loves the demon lord so much he can’t help it and an insensitive demon lord who cannot understand why she is being doted on. A story of the two filled with (the hero’s) love. I, The Demon Lord.—For Some Reason Am Being Doted On By The Hero. The first thing I need to say: It's adorable! This is a heartwarming story that really gives you those fluffy, sugarless sugar rushes when you're feeling down. Becareful for diabetes! This novel doesn't exactly have any real plot, but the characters are the kind that makes you squeal "aww!". Although there are probably better novels out there, if you just want a quick burst of happiness *topped with extra sweetness*, than this is it! Aye...I like cute stories. More often than not, they involve little to no plot and only run on glucose. But this... is a bad attempt at a cute story. It is painfully obvious how hard the writer was trying to make this into a cute story. And cute stories shouldn't be handled that way. On one side, we have a lolicon hero who has fallen in love at first sight with the demon Lord. This speaks volumes about the strength of character/ideals of the hero as he fell in love at FIRST sight... more>> with hi enemy knowing who she is. I basically have a 'hero' who is a lolicon. Dot. He does stand to the royal decree later on to protect his lover but really... it was already established that he is the strongest of them all. The Demon Lord. For a 200 year old Loli, all I can say is that she disappoints with her null dimensional character. Her ONLY 'cuteness' card comes from her Loli appearance. And her innocence?? She has been shown to not care about human life, and thus let her subordinates do as they please. Killing so easily... is not innocence. When she gets beaten and thrown into the hero's mansion, she continues to live there doing... cute stuff. Again, both of their characters are pretty much non existent. But this is a fluff right? Why care?? I care because this is BAD fluff. And not to mention, the romance. A series of s*xual harassments that eventually (probably) get her to love him back. While I might be cool with this kind of a romance in a CN or something else of other genres.... this book kinda like had ONE genre/job. And fluff is essentially fairytailesque. And this one falls just short of that, at 3. I am being lenient here, as I have only read 15 of the 22 chapters (this is short). But from what I see, romance and fluff have to be the only two things in this. And it fails, imho. RIP kidneys, albeit not so literally. Oh welp. Just shut up and enjoy the fluffiness. Did this really get completed? Because it just....... doesn't feel like it. Because there were some things that were left unquestioned and unanswered. Was "that" really the trigger to ending this novel? Wow. Stockholm Syndrome the novel. You know how some cute anime girls make people say "I want to take her home"? Well, the "hero" did exactly that. And nobody could do a thing about it, because he was that strong. And he kept her like a pet until she stopped resisting his advances. Leaves a really bad aftertaste. I feel that the author could have done a few interesting things with the setting too. I mean, it's a fantasy setting that has notebooks and internet at the same time as sword-wielding heroes.... more>> But we don't even have an explanation of how it works. I just don't know how I feel about this. It was such an abrupt ending, I thought I accidentally skipped some chapters. It was cute. No real plot or progression. An extremely tiny slice of life? I guess my advice is not to expect much and read this in between enjoying sips of tea. Haha, truly lovely. Why couldn't there be more chapter!? The pace was quite nice and everything played out well. But why, just why did author-sama have to leave it like that!? I so want to know want happens next. Cicily.. "Urgh, I mean Cecilia" is so cute and I hate Oliver for keeping her to him self but since I'm not in the novel, he'll have to do want I can't. But DOES IT EVEN MATTER if I can't read about it *crying*. 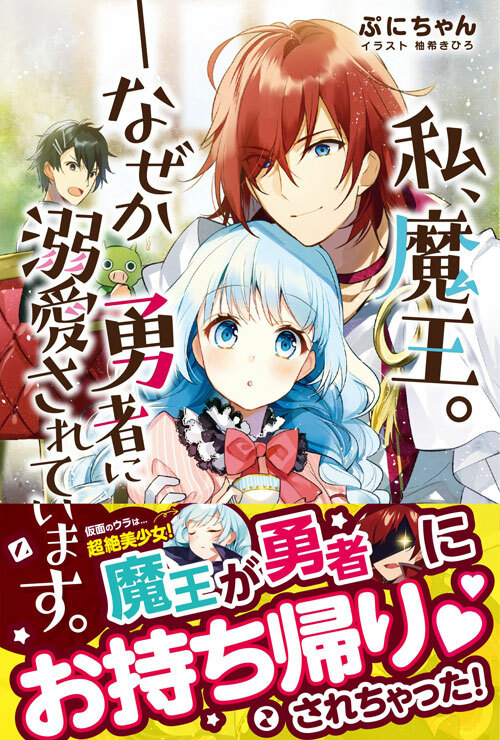 A light novel comes out with more story. The romance is so slow though (if not very very slow) and so I believe the number of chapter is not enough to show any real progress between the two. The epilogue is quite a bomb, but it just made me wants more!! In short, it is a fun read and I recommend it to everyone!! Its an okay novel. Just fluffy story about hero who fall in love with cute dense demon lord-chan and try to make her his own property, simple yet adorable. Its not bad, and isnt great either for me. Just act like novel for filling ur break time since its short.